Beach Bagels has won multiple awards for Best Bagel and Best Breakfast in our hometown of Wilmington, North Carolina. 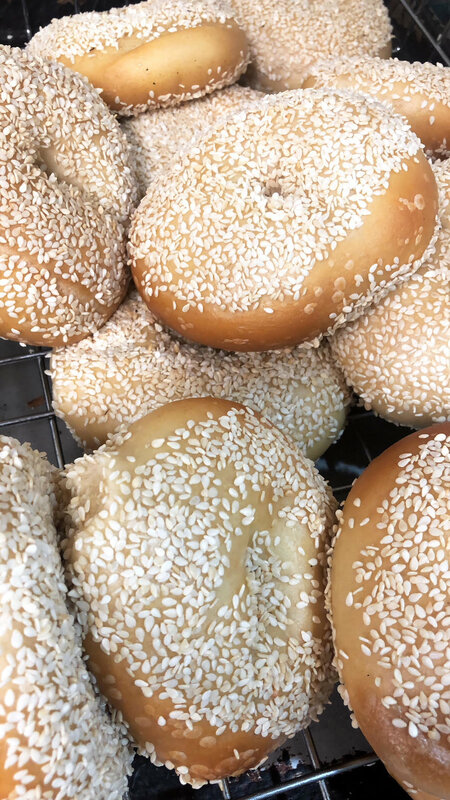 Our New York style bagels are made the traditional way. At Beach Bagels, we first kettle boil then bake the bagels, about 15 at a time, in a large kettle. This step effectively sets the crust and then into the oven they go. This labor intensive process results in the dense, chewy interior characteristic of a true bagel. From our bagels to bacon, from sausage to smoked salmon, everything we make is made with love. We also offer Boar's Head premium deli meats and cheeses for any of our sandwich creations, that can be served on in store-baked Kaiser Rolls, biscuits, ciabatta rolls, various wraps, and gluten-free bread. To find out more about Beach Bagels, check us out on social media, and visit a Beach Bagels to taste what we're all about. Beach Bagels is an award-winning, fast casual concept serving baked in-house bagels, espresso drinks, and all-day breakfast. Founded in 2012 in Wrightsville Beach, NC., Beach Bagels quickly became a local staple for college-aged kids and families. Known for our good energy and open kitchen concept, guests are entertained by the energy of our hustling kitchen staff making their signature sandwiches - cracking fresh eggs on the flat-top, the smell of our apple-wood bacon and our whole hog sausage sizzling. Our bagels are served with usual combinations of toppings like jalapeno black-bean hummus, fresh mozzarella, chorizo, and pimento cheese. Our monthly specials are topped with bold flavors, gourmet ingredients and are all made with love. Beach Bagels has now grown from its first location on the coast to three additional stores in the Carolinas.